How fast do you think that thing can go? 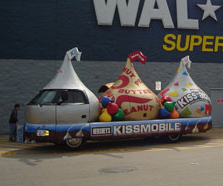 I’m wondering, because I think the funniest thing in the world would be for someone to steal the Kissmobile and take it on a high speed chase with the police. On a slow news day, you couldn’t really write better stuff. It would be even more funny if the panels were to come off at high speed revealing chocolaty goodness underneath. Imagine a spectacular crash at the end, that spills Hershey’s kisses all over the highway, with the highway patrol having to shoe small children away from the scene.